Production: Spacious, vivid although soft. 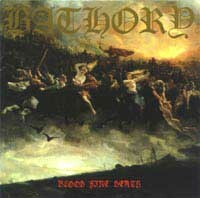 Review: In a genre that had inspired motion beyond the linear and reactive, Bathory made an epic statement of the spirit enmeshed in the ideology and symbols of the genre, rendering from Norse mythology a series of views into concepts of death and ultimate destruction. With a passion and sense of melodic poetry to songwriting unmatched by almost all bands, this Swedish act rendered a resurgent and vital journey through the subconscious to Jungian self-assertion. Opening with a classically-derived intro and brief allusive overture encompassing broad conceptual associations the album moves quickly into a style of riffing that hybridizes the fast flutterstrum of Slayer and more emphatic single-stroke arrangements to create a style that explodes with the dynamicism of majestic heavy metal and sinuously unveils its inner workings with the reptilian consciousness of raw and urgent, alienated, isolated black metal. Vocals are a hoarse shout giving credit to both the hissing howl of earlier Bathory works and the more ambitious vocal work on albums to follow. Songs are unique, in structure and in the essential juncture of melody and rhythm that forms their evolving core, and each holds attention through distinctive mechanism and in an honest artistic sense, states a theme which is symbolically linked to eventiture or conception and then naturally expands and destroys it as if events were playing out in a reality accepting the presuppositions of Viking allusion. Instrumentalism is precise and while sometimes rock-influenced, blends threads of ideal with a concentration of effort on melody and blasting raw riffs that exceed the study of motion and impact found on the second work from this band. Violent and yet varied in dynamic to present narrative scenario unfolding as a series of visions with associated perceptual emotions, these pieces bring mood to the forefront in a focus on development of story and listener immersion in the sensations and theory of that reality. Lyricism and an emergent sense of logic in noise distinguish lead guitar and vocal efforts in a fullness to these songs of mostly consistent harmonic construction. Structuralist lead riffing furthers intensity at times of precision or directional variability in melodic continuity of phrase and complements power chord riffing varying from the simplest to extensive progressions of similar structures within a melodic structure shifting with the harmony of song. As such, this is of the older school of metal on its way to the newer, and as the end of the previous cycle does all that a warrior of apocalypse must: summarizes the past and advances it to its height as a means of reducing it and forcing a search for new space to conquer. Influential visibly on Immortal, Burzum, Enslaved and Emperor, this album culminated the foundational work of Bathory and remains attentionable in the current time for its raw spirit and immortal melody in the assembly of storytelling. Epic and disenchanted meet in this saga of the end.